Thanks to my colleague Tom Klaver for pointing me the fact Cumulative Update 2 (CU2) for System Center Configuration Manager 2012 SP1 has been released. CU2 contains fixes for Microsoft System Center 2012 Configuration Manager Service Pack 1 (SP1). Cumulative Update 2 for Configuration Manager 2012 SP1 can be requested here. The Add Site Server Roles Wizard incorrectly blocks adding a site server when the first word of the server’s fully qualified domain name is longer than 15 characters. Multiple nodes and property sheets in the Administrator Console can now be announced correctly by screen reader software. Set the status of the entity Virtual Application 1 to Failed. Set the status of the job entity Virtual Application 1 to Failed. Nonalphanumeric characters in the CertificateIssuers string cause site assignments not to work in a System Center 2012 Configuration Manager Site environment. Task Sequences may ignore the Multicast Only flag when downloads are performed within the full operating system instead of Windows PE. Cumulative Update 2 offers limited support for deployment of Windows PE 3.1-based images. These images must be completed before they are added to the site server. If later changes are needed, they can be made by using the Deployment Image Servicing and Management (DISM) tool. Any Distribution Points that have the old image must be updated. "Software 09B – Computers with infrequently used software installed" reports do not contain accurate data for Windows Installer-based applications that are updated. Windows Mobile 6.5 devices no longer receive application policies after the site server is upgraded from the release version of Configuration Manager 2012 to Configuration Manager 2012 Service Pack 1.
in System Center 2012 Configuration Manager SP1. Content status may show a state of "Unknown" when a distribution point on a Configuration Manager 2007 Secondary Site is upgraded to Configuration Manager 2012. Status messages from pull-distribution points are now routed through management points instead of directly to site servers. This decreases the site server performance effect of having multiple pull-distribution points. ERROR: The component item for SMS_STATUS_MANAGER in the master site control file does not contain property list items for a status filter named "SMS_STATUS_MANAGER", or those property lists are corrupt or badly formatted. ERROR: Failed to configure sms ports ‘0x80020009’. ERROR: Failed to process port information. Active Directory User and Group Discovery methods may not update group relationship data when the "Enable delta discovery" option is selected. The CPApplet.CPAppletMgr Automation object returns error 0x80040154 when you use the object on a 64-bit operating system that has Configuration Manager Compatibility Shims (32BitCompat.msi) installed. The installer can now be run again on the same site server to create or to re-create deployment assistance items (packages and programs). The installer can update the Administrator Console directly when the installer is run on a site server or on a workstation where the console is installed. Earlier versions of the installer only copied the Administrator Console update (.msp) to the file system, and the console update had to be installed separately. The previous installation method of installing the update manually is still supported. The logging format is improved to increase detail for tracking progress or for troubleshooting installation failures. A supported update is available from Microsoft. However, this update is intended to correct only the problems that are described in this article. Apply this update only to systems that are experiencing the problems described in this article. This update might receive additional testing. Therefore, if you are not severely affected by these problems, we recommend that you wait for the next service pack that contains this update. If the update is available for download, there is a "Hotfix download available" section at the top of this Knowledge Base article. If this section does not appear, contact Microsoft Customer Service and Support to obtain the update. Note The "Hotfix download available" form displays the languages for which this update is available. If you do not see your language, it is because an update is not available for that language. 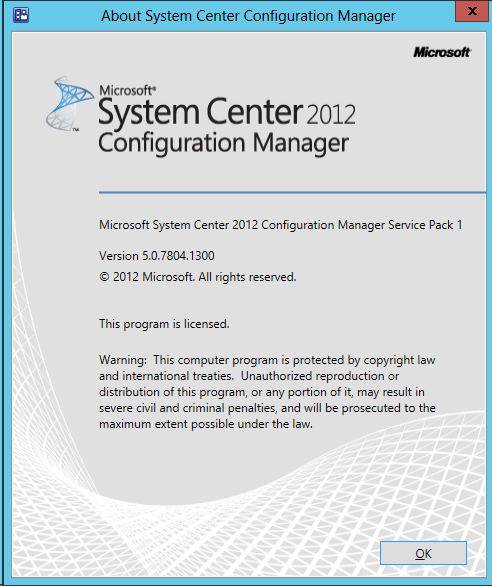 To apply this update, you must have System Center 2012 Configuration Manager SP1 installed. To complete the installation, close this wizard and restart the computer. This message indicates there are pending file rename operations on the local computer. These messages may have been present before the update installation. In addition, the messages may also have occurred because of the SMS_Notification service that restarts to handle client requests during the update process. A restart is not required for this update to be fully functional. However, the pending file rename operations will remain until resolved by a system restart. Note We recommend that you close the Configuration Manager Administrator Console before you install this update. Windows Live Essentials replaced by Windows Essentials 2012! Nice blog. But the error “internal server error 25011” with Configmgr 2012 SP1 with CU3 is still there. In a lab environment, i installed a SCCM SP1 server. The MP is configured in HTTPS and working. Also installed a MP and DP in an untrusted forest with HTTPS (and working). After installing the Application Catalog Website point, the internal server error 25011 was reported in the bgbisapiMSI.log on the site system of the untrusted forest. MP is reporting errors and not working anymore. After removing the Application Catalog Website point the error is still occurring and MP not working. Hi Erwin, well the credits goes to the Product Team! Will just serve the community by informing ;-) In meantime Cummulative Update 3 for Configuration Manager 2012 SP1 has been released. Perhaps this update might solve your persistent error although there is nothing refering in the release notes to this issue. Just to remind you October 18th Configuration Manager 2012 R2 will be released. I would make an attempt on the forum. chances are you can find your problem and even better able to help solve. Hi Ronny, thx for your reply. CU3 is installed in my lab environment.